…and I am a mother of five so have had to be very inventive on many occasions! This device was born out of necessity when my 2 year old was stung by a wasp and there was nothing available to buy to relieve it. I subsequently discovered that the old wives’ tale about vinegar soothing wasp stings appeared to be true and have been using it on my children ever since! I wanted to try and make such a simple effective remedy accessible to everyone and spent years thinking of ways to do this. The result is WASuP – a portable device which releases a bamboo wipe when activated (be sure to press hard, preferably on a flat surface) which will be soaked in organic apple cider vinegar, ready to unroll and apply to the sting in seconds. 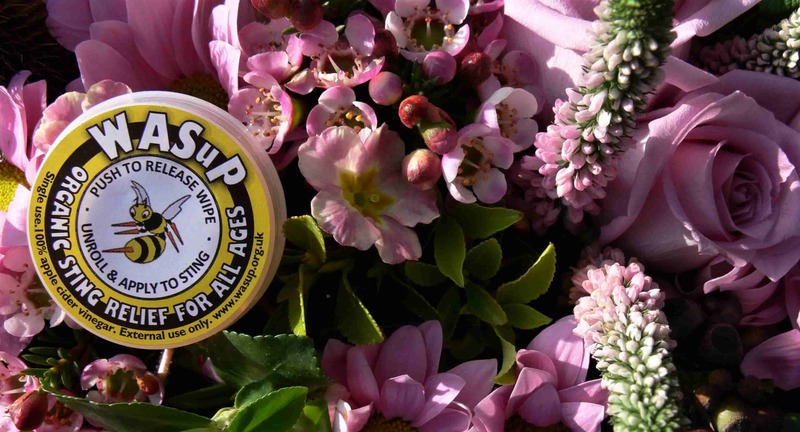 WASuP contains natural, organic vinegar and is suitable for all ages! If however irritation does occur, wash thoroughly with water and discontinue use. Anyone suffering any breathing difficulties or anaphylactic reactions to stings must seek medical help immediately. Do not use near the eyes or in the mouth. With a biodegradable magic wipe and recyclable container, WASuP isn’t just great for you: WASuP is great for EVERYONE.